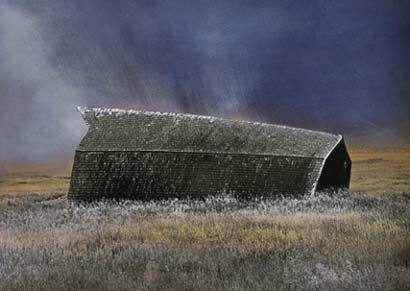 The June Bateman Fine Art is pleased to announce a one-man show of photographic monoprints by Denny Moers. IN THE ULTRA-SILENT LIGHT: Monoprints by Denny Moers is on view from September 4, through October 4, 2003. The public is cordially invited to attend an Artist's Reception at the gallery on Thursday, September 4 from 6 to 8 PM, and a Gallery Talk with Mr. Moers on Saturday, September 13 beginning at 2 PM. The show features thirty eight monoprints and four archival digital prints. A catalog is available. For over twenty years Denny Moers has created unique, technically innovative and visually stunning photographs of subjects ranging from medieval wall frescoes, to the landscapes and architecture of New England, the American West,Turkey, Egypt, Yugoslavia and Morocco. He cites music and poetry as central influences on his art and seeks, in the words of German poet Rainer Marie Rilke to "make the invisible visible". Moers process in creating his photographic monoprints begins by developing a traditional black and white silver chloride print, while leaving the photograph unfixed. The unfixed print is 'fogged' by exposing the paper to light, which alters its tonalities. Prints are then 'painted' by applying fixer, which stops the fogging process. They are also sometimes toned with gold chloride, selenium and sulfide, which react chemically with the silver to create rich tones of varying palates and intensities; the orange and reddish brown of selenium and the pale to Adriatic blue of gold chloride. The process is unpredictable, the results unknowable until the print is completely dry, yielding a monoprint which is unique to its moment of creation. The poetic possibilities of Moers work have long been appreciated by such esteemed poets as Robert Creeley, who has written introductions for two of Moers exhibition catalogs and has used Moers monoprints as covers on six of his books of poetry. Other poets who have used Moers work to illustrate their writings include C.D. Wright, Toby Olson and Denise Levertov. Four works in the exhibition are archival digital prints from the portfolio Between Now and Then, a limited edition portfolio of 11 plates and 12 printed sheets showing some of Mr. Moer's book covers, and published in 2003 by Huntington Press, Providence, RI. Denny Moers was born in Detroit, Michigan in 1953. He received his B.A. from Empire State College (SUNY NY) in 1975 and an M.F.A. from the Visual Studies Workshop in 1977. He was Aaron Siskind's first assistant during the early 1980's. Moers is currently an adjunct professor of photography at Roger Williams University in Bristol, Rhode Island, and the Rhode Island School of Design and has served as guest lecturer at Harvard University, among other institutions. He has received the Fellowship in Photography Award from the Rhode Island State Council on the Arts three times and received the Pell Award for Excellence in the Arts in 2002. His photographs are included in numerous public and private collections, among them the Museum of Fine Arts, Boston; Addison Gallery of American Art in Andover, MA; the Bibliotheque Nationale in Paris; Brown University, Providence, RI; Detroit Institute of Art, Detroit, MI; High Museum of Art, Atlanta, GA; Israel Museum, Jerusalem, Israel; Museo Rufino Tamayo, Mexico City, Mexico; Philadelphia Museum of Art, Philadelphia, PA; San Diego Museum of Contemporary Art, La Jolla, CA; and Santa Barbara Museum of Art, Santa Barbara, CA. Denny Moers has had numerous solo exhibitions of his work since 1978, most recently at the UB Anderson Gallery, SUNY Buffalo, NY (summer, 2003). He has been included in important group shows, including Lens Landscapes, at the Museum of Fine Arts, Boston, MA; Works on Paper: Digital Printmaking at Singer Editions, Davison Art Center at Weslyan University; and Calm and Commotion: Abstract Art from the permanent Collection, the Mississippi Museum of Art.